Peta is taking part in the project because they believe it is important to record stories of trans and gender queer people of faith especially at pioneering times such as now – histories should not get lost. Peta grew up on a farm in a rural village of about 5 houses in Somerset.“There were boys, there were girls and there was me”. After having a close look at the binary Peta now very much identifies as gender queer. Their body has always been naturally androgynous and hence Peta has always felt quite happy with it. They feel that gender is an artificial construct and the whole issue of gender seems unnecessary to them. Peta thinks that the distinction of the two “packages” and the gendered expectations that come with it (hobbies, behavior etc.) of what is considered to be male and female are very artificial. For themselves they decided to only do what feels comfortable to them no matter what the gender implications are. They speak about that people found it confusing to not know what they are because they don’t comply with the generally accepted social gender norms. This was especially the case when they were between 18 and 25 years old. Peta says: “Let them think what they think. It is not my problem. I don’t care anymore. And people found that a bit upsetting actually particularly at that period of life between 18 and 25. They find that very confusing […] that people don’t know what you are and I am like yes I know. What is your point? That coincided with me going to church so I think I got more pressure from that side than from anywhere else”. At university they joined the Christian union, which just happened for the reason that that was where they found most of their friendships. It was there that Peta first got inspired and excited about their faith, it became something that mattered to them. The Christian union, though, expected that Peta would become a normal heterosexual woman and were horrified when this didn’t happen, They asked Peta why despite reading the bible they were still queer, for being queer and being Christian was not acceptable. When Peta then got involved with a female leading member of the Christian union both of them were expelled from the Christian union and they were told to consider whether they would like to continue in the church, which was the hint for them to please leave. Peta was then also removed from their various roles in the church such as the choir. They describe this experience as quite a significant moment with regard to their faith because it showed they have always been an independent spirit. Peta mentions that they were their brother and sisters, and while they didn’t have to like Peta’s conclusion it was true. They wanted them to see Peta’s conclusion despite them not approving. After staying as a visible witness to them and to the LGBT members of the congregation who were hiding for another year, though, Peta left because it was very tiring and unpleasant to be part of a community in which they weren’t welcome. MCC (Metropolitan Community Church which is a predominantly LGBT church) just down the road of where they lived. 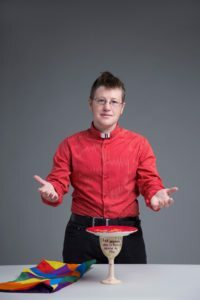 Peta says that for them it was important to be ordained which was not possible as a non-binary gendered queer person being in a (what they considered) lesbian relationship in the Church of England at that point (about 15 years ago). Hence Peta was very happy when they found the MCC in Brighton. MCC was also very happy that they joined because even though they were running trans awareness courses and were trying to be as inclusive as possible the Brighton MCC didn’t have any transgender people in the congregation at that time. However, Peta adds that they actually didn’t publically identify as trans at the time of joining the MCC. The MCC then created a baptism ritual for Peta when they changed their name and a ritual of blessing when Peta had their mastectomy operation. Peta talks about the MCC liking to create new rituals for LGBT people’s life moments and hence creating new traditions. In Peta’s opinion there is a certain kind of church, which appeals to people who like very simple answers, simple category, boxes and expectations. It makes them feel that they are safe and ok. There are no grey areas and one doesn’t have to think about it. This kind of religion doesn’t like LGBT people because they mess with their simple patterns and nice clear categories of life. Peta is now ordained as a pastor at the MCC.